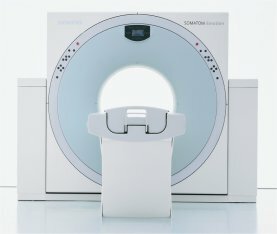 Siemens SOMATOM Emotion 6 Mobile CT scanner is the 6-slice configuration of the widely popular and used Siemens SOMATON line of scanners. With the Emotion 6, nevertheless, you can expect great versatility and high performance, from exam set-up to image acquisition and processing. The SOMATOM Emotion 6 mobile CT scanner remains ideal for most routine scanning procedures with its fast processing speeds and easy-to-operate features, capable of thin slice scanning to .5mm with rotation times as quick as 600 ms.
One of the most attractive features of this Siemens mobile CT scanner is its CARE Dose 4D system that reduces patient dose by up to 68 percent.